As detailed elsewhere on this website, we have been holding a variety of concerts at Gillingham Methodist Church since 2004, primarily to help pay for the restoration of our Sweetland organ, but also from time to time in support of general church funds and other good causes. We have recently been looking at ways of increasing the value of the money we raise by claiming Gift Aid back from the Government. To do this, the money raised must have been given as a voluntary donation, not as an obligatory ticket price. 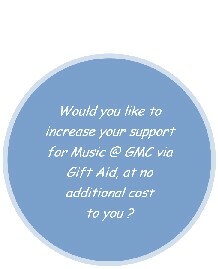 Therefore we are setting up a new scheme - Friends of Music @ GMC - and if you are a UK taxpayer we would like to invite you to join. We ask our Friends to fill out a Gift Aid declaration and in return we will give you a free pass to all of our concerts. There is no charge for joining this scheme, but we would invite you to make a voluntary donation equivalent to the ticket price when you receive your ticket. We will need to keep a record of your donations for auditing purposes. To be clear, you are under no obligation to make a donation, but we believe we can trust our Friends not to leave us out of pocket! For those who are not UK taxpayers or who do not wish to join the scheme, we will continue to sell tickets or accept donations in the usual way. So, if you would like to join, please fill out the form you will find in the Church and place it in the collecting basket on your way out. Alternatively, you can click on the email link below to contact me and I will email you a form. Thank-you.